If you have a handy inspection checklist then your job will be more easier. It always happens to me. When I check something without an inspection checklist I always forget some points to check. After checking when I come back to my desk then I remember oh! I forgot to check that point! But it is not happened now. I made inspection checklist format for different items of building for myself. In this post I’ll share an inspection checklist for footing. There are various types of footing. This inspection checklist focuses specifically on the shallow footing. We mostly use wooden form in footing. 1. Form work Material: Form work material should be strong enough to withstand against the load of concrete. If you use wooden shutter material for form-work, make sure the thickness of wood is not less than 1″. And it is free from defects. 2. Water-Tightness of Form: Make the form leakage-proof by using 32 gauge thin metal sheet in the wood joints. Fix the metal sheet with nail to make the form water-tight. 3. Footing Dimension: Make sure the form is made with specified footing dimension in drawing. Check the inside dimension of the form for inspecting length, width and height of the footing. 4. Placing Form: Check the form is properly placed related to grid-line. 5. Quality of Reinforcing Bar: Make sure all reinforcing bars are straight and free from cracks. Check they are cleaned and no excessive mortar or other materials on the bar’s surface. 6. Size and Spacing of Reinforcing Bars: Check the diameter of reinforcing bar and they are spaced correctly as specified in the drawing. 7. Clear Cover for Reinforcement: Clear cover for reinforcement should not be less than 3″ for footing or specified in the drawing. Make sure it is maintained properly in all around the reinforcement. Also check all rebars are properly placed and tied. Make sure rebars are supported properly with chairs, spacers and mortar blocks. 8. 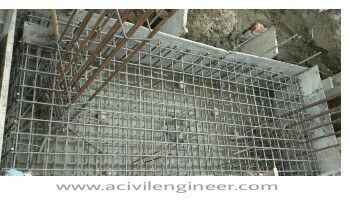 Column’s Reinforcement: As we know footing is constructed to get the load from column and transfer it to the base-soil. So make sure column’s reinforcement are placed correctly as specified in the structural drawing. Also check the size, numbers and placement of column’s reinforcement as shown in the column layout sheet of structural drawing. 9. Accessibility to footing: Make sure the footing zone in easy accessible and safe for concreting. 10. Ingredients of concrete: If you plan to cast the footing with machine mix concrete, make sure you have enough materials, such as stone chips, sand and cement available in the project. Make sure concrete ingredients are cleaned throughly by water. If you plan to cast the footing with ready-mix concrete, contact with supplier when they can supply the concrete. Make sure you have enough man-power available to pour concrete. Make sure all the required tools and machineries are available in the project and in working order. Also make sure fuel and constant power supply are available when required. 12. Cleaning Form-work: Throughly wash the inside of the form with water. But no water should be allowed inside the footing. Unwanted materials also should not be allowed inside the form of footing. If all the check points are satisfactory you can now move on to pouring concrete. Do you want to add any point in this checklist? Please do this in the comment below. This is a very beneficial check list. I will be adopting it. Kindly Link to checklists for other construction stages too. Cheers. I’ll try to publish checklists for other construction stages too. 1. Signboard, safety signboard and fence available. Excavated material placed inside the plot limit. 2. Excavation Level, PCC 10cm below Foundation and polythene sheet of 1000 gauge had been provided. 3. Axis and North direction as per drawing. 4. Orientation & Centering of Columns & Location of Columns are as per drawing. 5. Foundation size, Orientation & Location as per drawing, 50mm Cover Blocks provided properly. 6. Re-bar dia., placement; Overlap and verticality as per drawing. 12. Cool Water, labor rest room safety helmets and shoes of labors, first aid box, and fire extinguisher are available at site.